1.2 Table of receiving money by lenght of being in club. In order to sell a player you have to place him on the transfer list. When doing this, you must also choose a category from goalkeeper to forward, and set an asking price. Note that most people will search by skills whichever category you select, so it doesn't matter much what player category you place him in. A new rule from global season 38 is that you can not transfer list a player more times than he have played games for your club. This action was taken as a step towards realism and against day trading. You have to declare a starting price for the player. This is the lowest amount for which you're prepared to let him go. He'll be on the transfer list 3 days before going to the club that has offered the most for him. There are various theories regarding the value of starting prices, with some people feeling players should always be listed for 0, whilst others prefer listing for the minimum price they feel is acceptable. A sold player disappears off to his new club immediately after the bidding is over (although note this may take some time, particularly if the servers are busy). If a buyer isn't found he stays at your club. If you have placed a player on the transfer list you MAY NOT change your mind! He's there for 3 days, and that's that! The only possibility to hold him is to 'buy' him (but you will have to pay the transfer fees). Also, keep in mind that all information on the player's abilities will be made common knowledge when you place him on the transfer list. You may select a player for the team even if he is on the transfer list; however, if he is sold by the time the match starts, a substitute player will take his place at the pitch. If a player is sold during a match, he will finish the match and then leave. After every completed deal, the player's agent, mother club, and last club will all take their cut of the sale price. The exact amount you will receive depends on how long the player has been with your club. 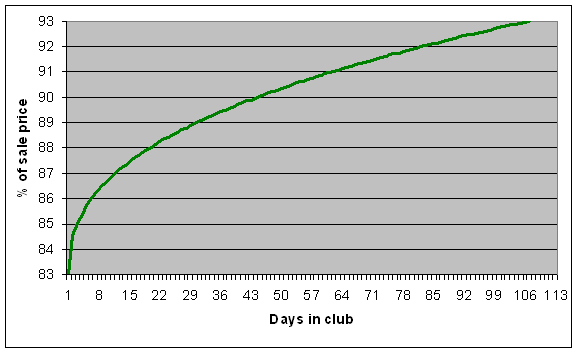 The least you can except after 0 days in club is 83%, the most is 93% after 106 days. The table below shows how % goes by days in club. (Exception is 95% when it's your own youth player, because you can expect the 2% of mother club money) It will cost you € 1 000 to place a player on the transfer list, which is not refunded if he isn't sold. Note: If you are selling one of your own youth players you are not considered the previous owner - but the next time he is sold you will receive previous club money (if he has played a match for your team) as well as 2% of the sale price for being the mother club. After that you will only receive money for being the mother club whenever the player is sold. The sale of a player after up to exactly six days (= 144 hours) from being pulled from the youth squad will never result in a loss of team spirit. Table of receiving money by lenght of being in club. In order to buy a player from another club you have to visit Hattrick's player market, under the Transfers menu. This is where you'll find out who's for sale. You can only buy players on the transfer list. You can't buy, or exchange, for that matter, players directly from another club. If you don't see a player that you like in your country's local market - you can search either an individual country or by one of eight regions, these are all available from the drop-down box on the transfer search page. When you've found a player you want, click on his name and you'll enter his player page. This is where you may place your offer. You must raise the bid by € 1 000 or 2% more, whichever is greater. Note that the sum of your bids cannot put you more than € 200 000 into debt. Bids must be raised by a minimum of € 1 000 or 2% of the existing bid, whichever of the two amounts is larger. You may bid on a player right up until the deadline. If someone places an offer less than 3 minutes before the deadline, the deadline will be reset to 3 minutes after the last bid. This process continues until a full 3 minutes have elapsed without a fresh high bid being placed. A sale is confirmed when the words "Bidding is finished" appear beneath the selling price. Also, when you win an auction, if the new player does not get along with his teammates, you may see team spirit decrease. Keep in mind that the server might be down just as the deadline is running out. You'll be taking a chance by waiting until the last minute before making your move. If the server is down, you're to blame for not acting earlier. A great help when buying players is the information concerning his abilities, personality etc. You may also want to consider a player's TSI, or Total Skill Index. However, the current market value of a player may differ greatly from what his TSI might lead you to expect as, above all, it's his top ability (or abilities) that is most relevant - a player being "world class" at something and "weak" in all other abilities will fetch a higher market price than one who is solid at everything. Remember that even if current form doesn't have a lot of impact on the market value, it will matter for his next couple of games. An expensive player won't necessarily be the saviour you need to get your team out of a tight spot. If you wish, you can use the Transfer Compare button in order to see what a similar player has recently been sold for on the market. Good players and money are key aspects in Hattrick, which makes it very important that no teams benefit from abnormal activities on the transfer market. This means that all bids should be in relevance to what could be considered reasonable for the player in question. Remember, it's not only prohibited to have several teams but also to "help" friends or family by buying players at inflated prices. The GameMasters are fully authorized to cancel or adjust abnormal prices, hand out fines to teams or even ban the users involved. Whenever you buy or sell a player there are chances for your team spirit to drop. This drop can be visible or invisible (due to the fact that it might not drop a full level), but when it happens there is always a message on "The Club" page. In average, you have the lowest chance on getting a TS-drop when you buy and sell only sympathetic guys. This page was last edited on 19 August 2009, at 13:30.